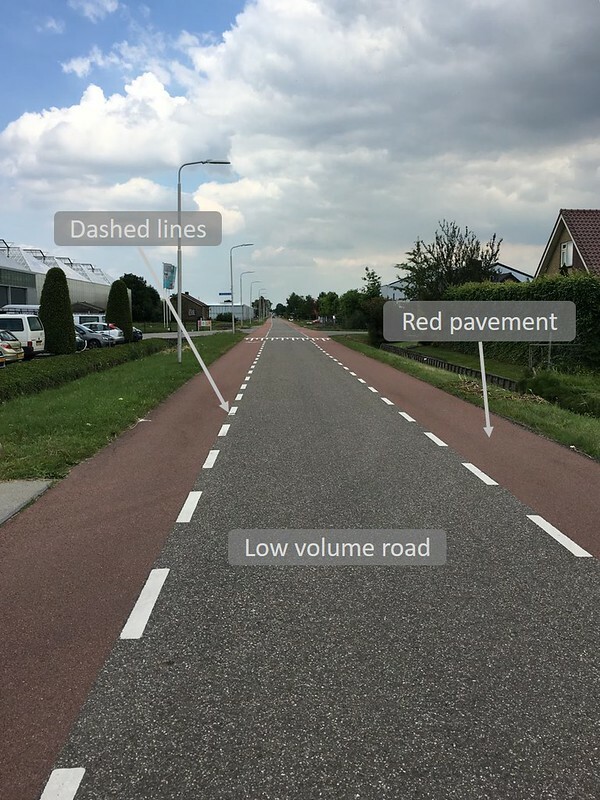 Bicycle lanes are a more traditional way to incorporate bicycles into traffic by giving them a marked off lane (solid line and red paint or another paving pattern) next to motor traffic. This intersection was built in the 1980s and as a result the only bike facility utilized are bike lanes. 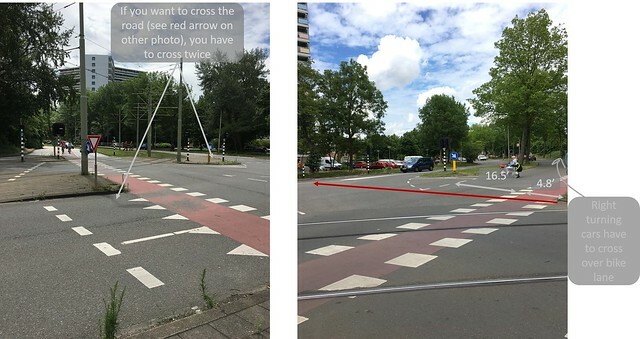 I think this intersection was aimed to be the most convenient for cars because as a pedestrian if you want to cross Buitenhofdreff from the right side of Martinus Nijhoflaan, you have to cross both streets. As a cyclist if you are turning left onto Buitenhofdreff the cars have to cross over your lane to turn right (not shown). This main road has a busy school on it, and because cars were going at a faster pace the school asked to reduce the speeds from 50 kmh to 30 kmh and the town responded by making a small section of the road slower. However, all 30 kmh roads do not have bike lanes because at that point it is safe, so bikes have to go from lanes to mixed traffic to lanes again. Some measures the city put into place to try to slow down cars were placing bollards at the entrance to draw attention, red pavement to give the illusion that the drivers were in a new, smaller road, tightening the curbs so it the road appears thinner, and placed a speed hump. Speed humps are less severe speed bumps that still aim to slow down drivers, but not as abruptly. They are marked with piano key paint markings as shown in the photo. Despite all of this, cars did not slow down enough because the zone was too short and I just felt more unsafe biking in the mixed traffic than I would have been if I was in a bike lane on a faster road. This intersection felt unsafe and a little bit confusing as a biker. There was a ton of paint on the intersection itself, but not all bike lanes are marked in paint so I wasn’t always sure if I was in the right spot or if I was going to be hit by cars. I also didn’t like how there were so many pocket bike lanes. A pocket bike lane is when you are going straight or left, and the cars doing the same are to the left of you, but all right turning vehicles are in the lane on your right. I don’t like being sandwiched between two cars because if the right turning driver didn’t fully understand they could hit me and I was very exposed the entire intersection. One thing the designers did do correctly was have a bunch of bike-specific traffic lights. This makes it a lot easier to know when to go, because your light is right there. In the US, I have to look at a combination of the pedestrian and car traffic lights and neither of those are positioned for me to see. A bike boulevard is a long bike route that follows calm local streets. These paths discourage motor traffic through things like speed humps, bollards connecting cul de sacs, contraflow bike lanes. Occasionally there will be jogs, a short bike path connecting a disjoint in the bike boulevard on a busy street. This long bike boulevard is very convenient for commuting students and locals who want to grocery shop. The boulevard is also very safe, despite having a drawbridge and nearby construction. At the drawbridge, only bikes and pedestrians can cross making it a low speed, safe zone where the worst injury someone could sustain is being clipped by a bike. 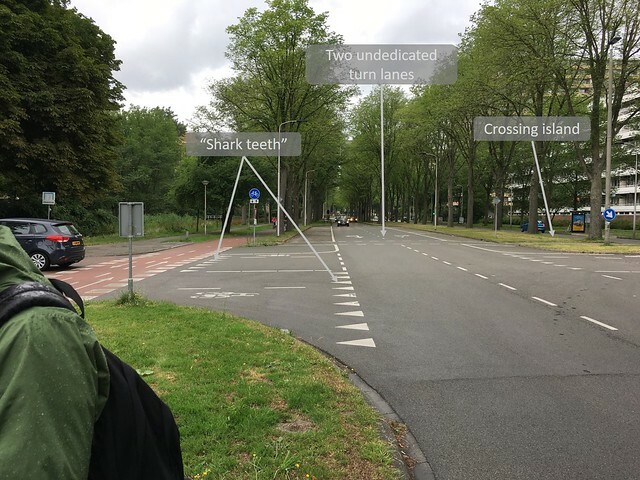 This gives the locals an alternative to crossing the canal without worrying about waiting for a light and driving with cars. The path also features a grocery store, allowing people to have easy and safe access to shop. 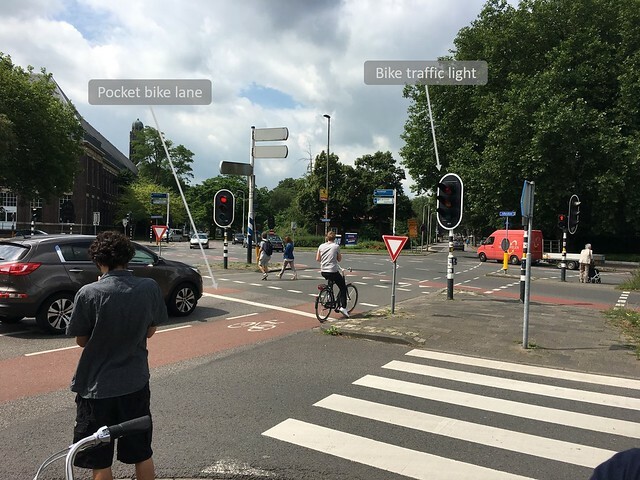 The construction area is also handled with safety in mind, there are white and red signs before you reach the area and enclosed fences around the area, so the user knows what they’re biking/walking into and restricting them from entering a dangerous zone. I felt very safe traveling on this bike boulevard. On one side of it, there is low volume (about one car every 5 minutes), one way traffic and on the other side of the canal, there is no car traffic at all. On the side with traffic, bikes can go in either direction (the direction opposite to the one way car traffic being contraflow). It was scenic, quaint, and bikers have places to park their bikes if they want to stop and admire the canal. 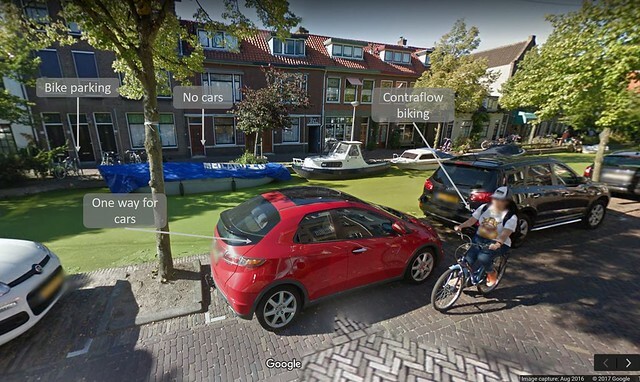 This street is a perfect example of where designers could put bike boulevards, because bikers don’t need as much space as cars and this road provides a nice ride as you are travelling through the city. Cycle tracks can be one or two way red paths that bikes can travel on. 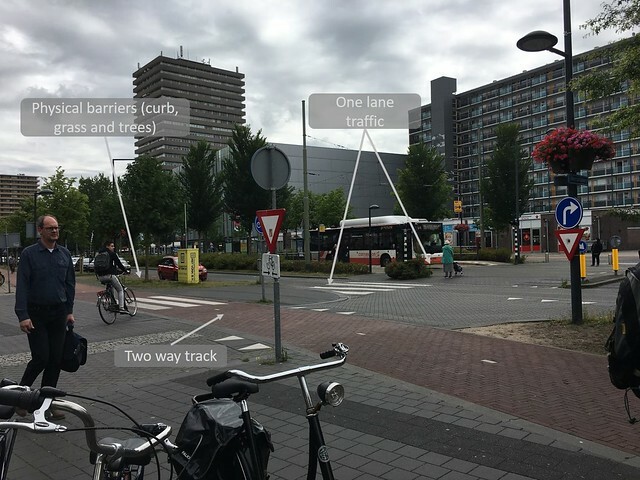 There is either vertical separation or grass between the motor road and the cycle track and usually a less severe vertical separation (like a rounded curb with trees) between the bikes and pedestrians. This road was originally 5 lanes, two lanes for each direction with a turning lane. 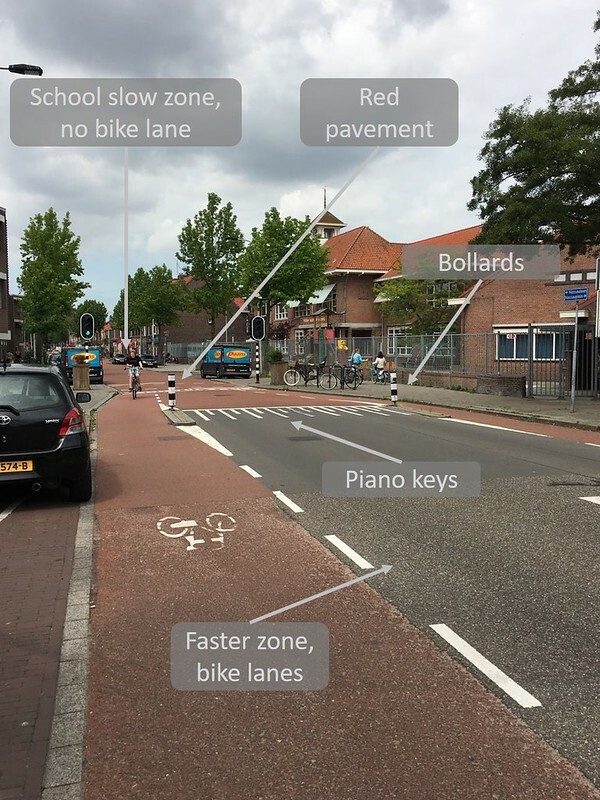 In order to reduce speeds to allow bike and pedestrian traffic, Delft cut the road down to one lane in each direction and added cycle tracks. The cycle track is completely separate from the cars with a curb, grassy area, and trees. This not only provides a buffer zone if a car or bike were to lose control and crash so that they would slow down and/or crash into a tree instead of another user of the road, but also makes the road appear narrower so the cars naturally slow down for crosswalks. The cycle track is also two way on each side of the road, preventing excessive crossing of the street by bikers and bikers biking the wrong way down a track to get to another shop on the same side of the road. Vorhofdreef is a distributor road (a large volume and speed road) connecting to an expressway. The issue here was that pedestrians kept getting killed while crossing. The road got a redesign to make it safer. The key features that make this crossing safe despite the high speeds of cars are the two undedicated turning lanes and the crossing island. The removal of the dedicated turning lanes creates less lanes the pedestrian has to cross, making it easier for them to see the cars in all lanes so they can cross at the appropriate time. The tradeoff here was that the risk for rear ending and side swiping is now higher. But pedestrian lives are far more important than damaging the exterior of a car so this is a tradeoff that needed to happen. 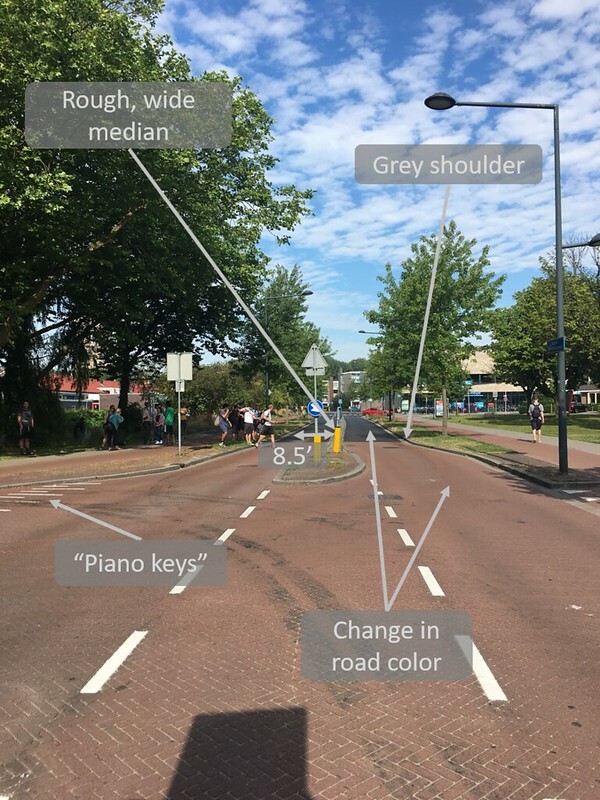 The crossing island is also another key safety feature because this way the pedestrian only needs to look one way to cross each leg, and has to cross only two lanes at a time rather than four. The bikes have to be separate from the cars because the speed limit is about 50 kmh. The cycle track also gets the right of way when crossing Jan Campertlaan because it is harder for the bikes to stop than the cars going at a low speed on this smaller road. The cars and bikes both know this with the communication of the shark teeth, markings on the road that point to who yields. One of the issues with cycle track is that it adds another element into intersections, which can be difficult on high volume roads. 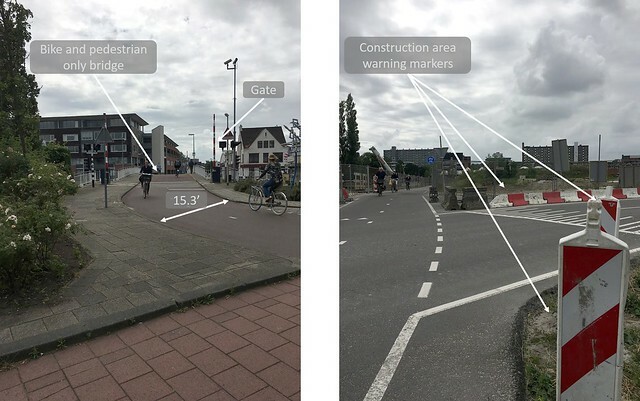 Ruys de Beerenbrouckstraat is an example of how engineers can make a large distribution road safe for bikers and pedestrians while still making it efficient for cars. Three things that the planners did were make the street seem narrower, raise the crossings, and make a change in the color of the road. To make it appear narrower there is the rough, wide median and the grey shoulder. This makes cars go slightly slower because they don’t feel as comfortable. The change in road color also draws attention to the drivers and make them feel like they need to be more aware of their surroundings, because they’ve entered a new section of the road. The raised crossings are also important, and these are marked with the piano key paint. Having a raised crosswalk allows car drivers to see cyclists and pedestrians better, and slows them down when turning onto the street. Advisory lanes are on unlaned thin roads that wouldn’t normally be able to host bike lanes if a centerline was marked. Instead bike advisory lanes are painted and marked off with a dashed line so two cars approaching each other and go into the advisory lanes safely. Hugo de Grootstraat is a road with a school on it, so you would expect the road to be very safe, but it isn’t as safe as it could be. One can tell the road is so thin because the buildings were built in a time where cars weren’t the main mode of transportation. 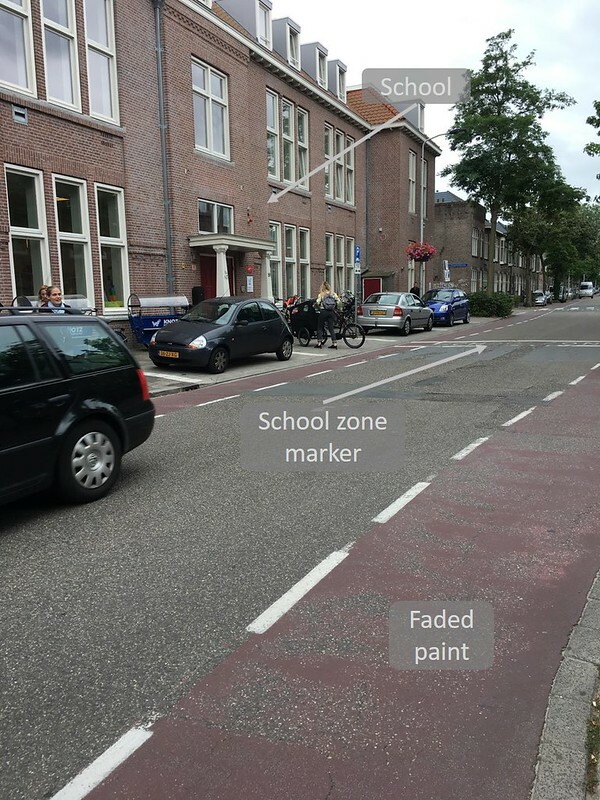 There is a school zone paint marker, but that along with the red bicycle lane paint is faded. This road felt okay to me riding it, but I saw a mother biking next to her child because she didn’t want to risk a car not seeing them so I can only imagine at peak hours this street is unsafe because there are so many children being dropped off. The tradeoff of having cars down this one way street is that bikers and pedestrians aren’t as safe as they would be if it were remade into a bike and pedestrian only road. The advisory lane works well in this context because the street needed two parking lanes and if the road were to be designed with normal bike lanes, it would not have fit. 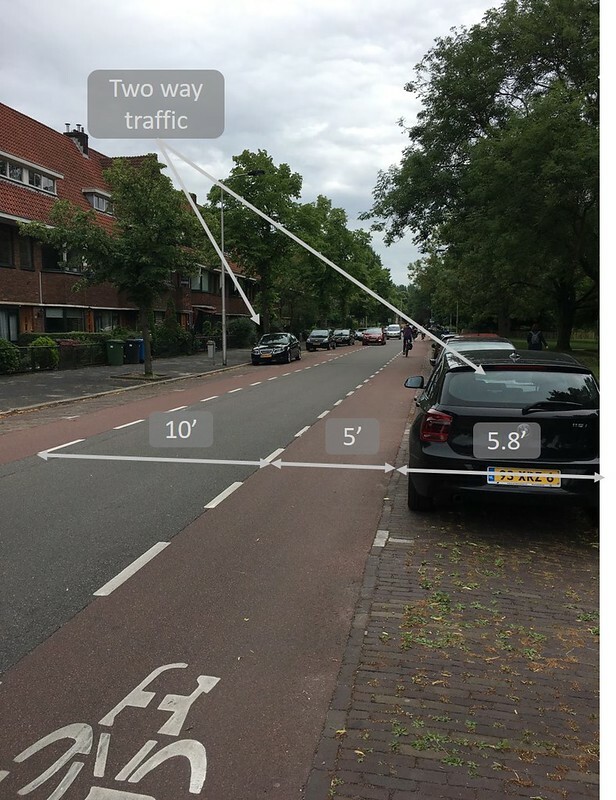 So the advisory lanes are wide enough that the bikers can avoid dooring and cars can pass them, and they allow everyone to feel safe using the road. I personally felt safe using this road, and while there wasn’t a lot of cars parked at the time, I am sure overnight both lanes of parking are needed. The main purpose of advisory lanes is to give space that cars don’t need and give it to bikers. This rural road with very little traffic is two-way, but there is rarely a biker and two cars all passing each other because it is so low volume. So bikers feel safe in their marked off, red paths, and cars can dip over the dashed lines when passing by a car or biker. 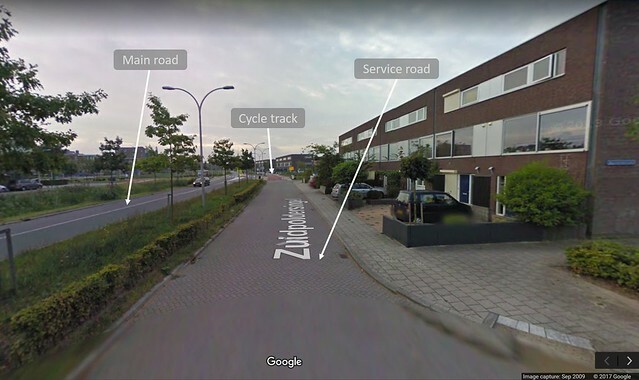 A service road is a lower volume road next to a highway road that bikes and people who need to get to the residences can use. The bikes ride as if it is mixed traffic, but cars only come a few times a day and the road isn’t used as a cut through because there is a faster road right next to it. Riding on a service road reminded me of riding my bike through quiet neighborhoods. We saw no cars on the road the entire time we rode on it, and we had the whole road to ourselves. These service roads are very safe and are like really big cycle tracks with a few slow cars, and is a great alternative to bicycle lanes on the main road and are more economical than separate cycle tracks and having a lot of driveways on the main road. This particular service road even turns into a cycle track at the end, providing an outlet for bicycle riders to go rather than reaching a dead end like it does for cars. A bicycle highway is a long distance, little to no stop cycle track. Bikers can travel long distances at a faster pace making commutes easier. I love this idea and I think that it is a great idea for giving commuters an option to bike to work despite living a few kilometers to work. The track has everything needed for bikers; street lamps for night time commutes, a vertical separation between the highway and the track, and even an area with benches that they could rest at if they get tired. The car highways are also designed with safety in mind. 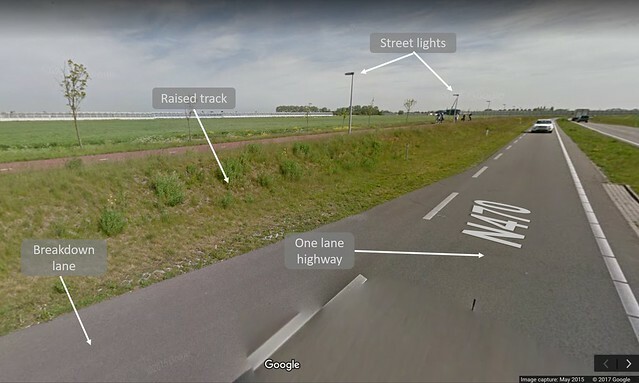 It is only one lane, almost eliminating speeding by making everyone follow each other, there is also a section of a breakdown lane, and the grass next to the highway has a concrete layer underneath so if a car can’t make it to the breakdown lane, it won’t get stuck in the mud.